The Soozier Steel Vertical Stair Climber Exercise Machine is a full body workout machine that mimics the movements of rock climbing to burn calories, build endurance and work all of your major muscles. Its compact size means that no matter how much free space you have, you'll always have room for a daily workout. With an ergonomic design and five levels of adjustable height, it's ideal for all body types. A handy monitor displays time, frequency, counting and calories so you're always in control of your workout. Though lightweight, solid steel construction supports up to 220 pounds. Our Soozier vertical climber is easy to assemble, use and store offering an effective workout when and where you want it! 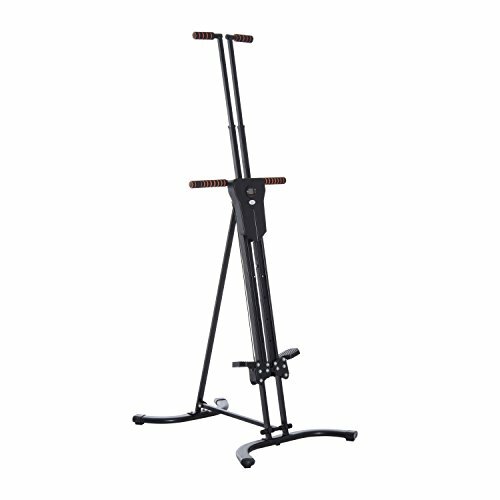 - Handlebar Lowest Height: 17.75"- 22"
- Distance Between Feet: 2.25"